In addition to expanding my knowledge of barcode systems, the aim of this learning exercise was to create a very simple spreadsheet application that would contain a list of EAN13 codes, which could then be printed on to labels so that they could be attached to product packs that were not supplied with a barcode label. This allowed these additional products to be scanned into an automated product storage and retrieval system. EAN13 barcode font (ean13.ttf) installed on each PC that you wish to open the spreadsheet. This project uses code and font provided in the “barcode fonts and encoders” distribution available on Sourceforge. The Barcode Creator tool is made up of two sheets “BarcodeCreator” and List. To add a product and barcode to the system, navigate to the “List” Spreadsheet. 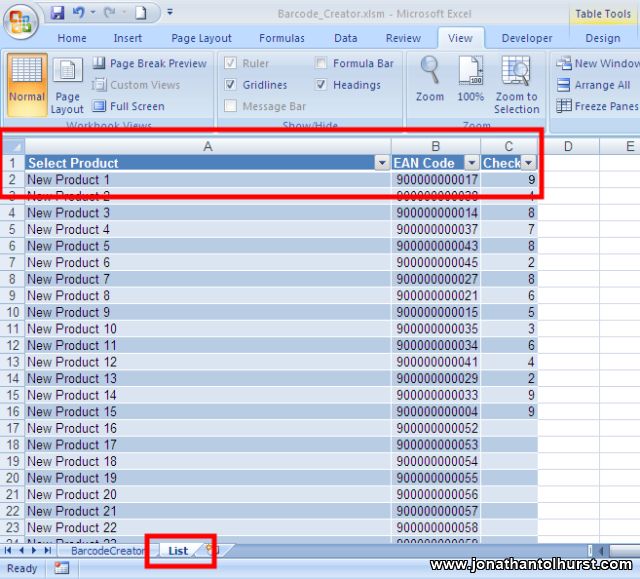 Enter the product description in column A and then the first 12 digits of the chosen EAN code in column B. (The last digit is the check digit and is calculated – once you know what it is you can add it to column C). Once you have added the entry in the “List” spreadsheet, make sure you save your changes. Go back to the “BarcodeCreator” sheet and then select the product from the dropdown list. On selection, four barcodes will appear to the right (I required 4 identical barcodes to be printed on one 760mm x 380mm label, although you can modify to suit your own purposes by adjusting the print area). The print area will be shown in print preview. You may need to modify the paper size and orientation settings to suit your requirements. And that’s it! Very simple printing of barcode labels using a Macro-Enabled Excel Spreadsheet. The "List" Sheet where the product details and EAN13 code are entered. I have created this set of questions on as a learning exercise in order to help me fulfill my CPD requirements. What is the special name for the last digit of an EAN-13 barcode? The last digit of an EAN-13 barcode is the checksum digit and must be calculated from the data digits before it can be encoded. What type of barcode would you expect to find on the packaging of a medicine in a UK Pharmacy? Which one of the following is a matrix (2 dimensional) type of barcode? The correct answer is the QR code. 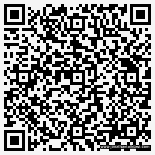 Invented by Denso Wave in 1994 to track vehicles during the manufacturing process, the QR Code is one of the most popular types of two-dimensional barcodes. What does EAN stand for? EAN was originally European Article Number, but now renamed International Article Number even though the abbreviation EAN has been retained. 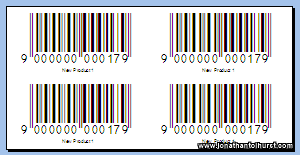 What additional piece or pieces of information could be included in a 2 dimensional product barcode that would be of use in Pharmacy Stock Control? A random, unique identifier to help prevent counterfeiting.